The way of consuming music has drastically changed in recent years. I wrote about it in my article about the importance of critical listening for musicians. Streaming services are clearly the future of music listening even though many people hesitate to admit it. A physical CD or LP will serve mostly as a collector’s item or as a reminder of a great concert. Myths about the stream (often used as arguments by people who refuse it) were nicely debunked in this episode of the DIY Musician podcast. Personally, I’m no longer happy with CDs (they are bulky, they get lost and damaged easily) neither with mp3s (they occupy storage capacity and attract piracy) nor YouTube (I watch more than I listen and it doesn’t work offline). Streaming services like Spotify, Apple Music, Deezer, Google Play, etc. seem a like a small miracle to me. I use Spotify and can recommend it. Not only I and my family can choose from more than 35 million songs to listen for just 9€/month, Spotify algorithm recommends me good music I would never discover and the app can play local files from my computer so I can have all my music in one place. And there are Spotify playlists. That’s why I write this article. Many Spotify users don’t search for music actively but rather listen to what someone else recommends to them. It can be the algorithm (playlists like Your Daily Mix, Release Radar, Discover Weekly), a playlist curator working for Spotify, or just another user like you or me. I created 2 playlists for you on Spotify. ATAmusic: Bluegrass History is a playlist created according to the list of recommended bluegrass recordings that was put together by Henrich Novák with a little help of Petr Brandejs, Ralph Schut and myself. ATAmusic: Bluegrass Explorer is a playlist that includes both new and older music that doesn’t necessarily fit in the narrow box of bluegrass genre but is somehow related to it and can be labeled as New acoustic, Americana, Newgrass, Country, Folk, etc. 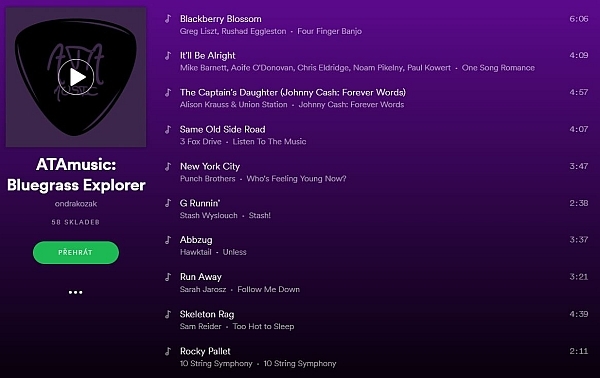 This is the music that I’m interested in most as a listener and musician. I will update the playlist regularly. 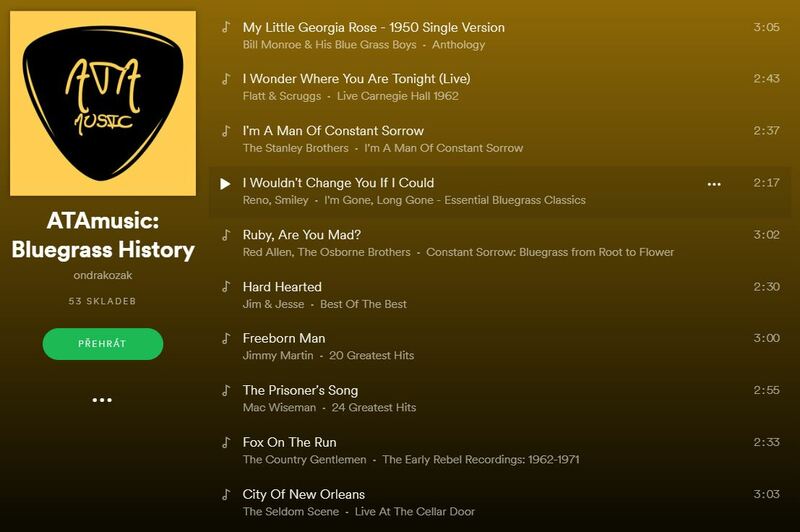 To have a quick overview of the bluegrass genre from its beginning to its contemporary forms, check out the ATAmusic: Bluegrass History playlist. If you’re interested in learning about the new ways the (bluegrass-somehow-related) acoustic music has followed recently, follow the ATAmusic: Bluegrass Explorer playlist. If you don’t have a Spotify account yet, simply create one here. Then search for ATAmusic playlists or just click the links above. One final tip for active musicians. To have your music available for streaming services, you need to use a music aggregator/distributor service. There are several out there and they offer different services for different fees. Check out this useful comparison of digital music distributors. Some of them don’t even charge anything if you want to distribute your own music. Whether you listen to or create music, share it! It has never been easier.